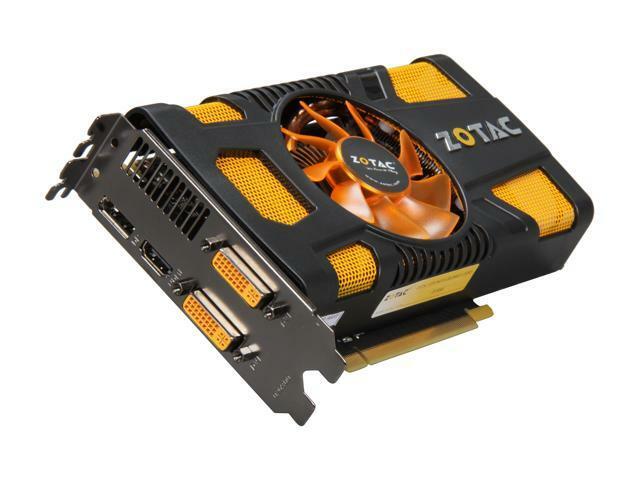 Experience Microsoft DirectX 11 technology the right way with the high-performance ZOTAC GeForce GTX 560 Ti graphics card with hardware tessellation technology. The ZOTAC GeForce GTX 560 Ti renders the latest games with stunning clarity and detail for an unmatched visual adventure. NVIDIA SLI and 3D Vision Surround readiness enables two ZOTAC GeForce GTX 560 Ti's to work together and deliver up to twice the performance of a single card or enable triple-monitor gaming with stereoscopic 3D effects for the ultimate gaming experience. NVIDIA PhysX technology takes realism to another level for unprecedented immersion with the ZOTAC GeForce GTX 560 Ti graphics card. Microsoft DirectX 11 Support DirectX 11 GPU with Shader Model 5.0 support designed for ultra high performance in the new API’s key graphics feature, GPU-accelerated tessellation. NVIDIA PhysX Technology Full support for NVIDIA PhysX technology enables a totally new class of physical gaming interaction for a more dynamic and realistic experience with GeForce. NVIDIA 3D Vision, 3D Vision Surround Ready NVIDIA 3D Vision brings a fully immersive stereoscopic 3D experience to the PC. Expand your games across three displays in full stereoscopic 3D for the ultimate “inside the game” experience with the power of NVIDIA 3D Vision and SLI technologies. NVIDIA Surround also supports triple screen gaming with non-stereo displays. NVIDIA SLI Technology Industry leading NVIDIA SLI technology offers amazing performance scaling for the world’s premier gaming solution. NVIDIA CUDA Technology CUDA technology unlocks the power of the GPU’s processor cores to accelerate the most demanding tasks such as video transcoding, physics simulation, ray tracing, and more, delivering incredible performance improvements over traditional CPUs. NVIDIA PureVideo HD Technology The combination of high-definition video decode acceleration and post-processing that delivers unprecedented picture clarity, smooth video, accurate color, and precise image scaling for movies and video. Pros: This thing has lasted me quite a while. Its run most of what I could through at it but sadly its time for an upgrade. Cons: It doesn't do what my 670 does. Comments: Ive always like Zotac, Ive owned 6 cards from them now, and i definitely prefer them over EVGA or any other Name Brand.